Welcome to our full review of the Dirty Hand Tools log splitter 22 ton professional grade model. Let's face it....Choosing the best hydraulic log splitter can seem intimidating at first. What size should you choose? Which brand or manufacturer? How much money should you spend? With so many different models and options on the market, buying the perfect log splitter might seem like an impossible task. 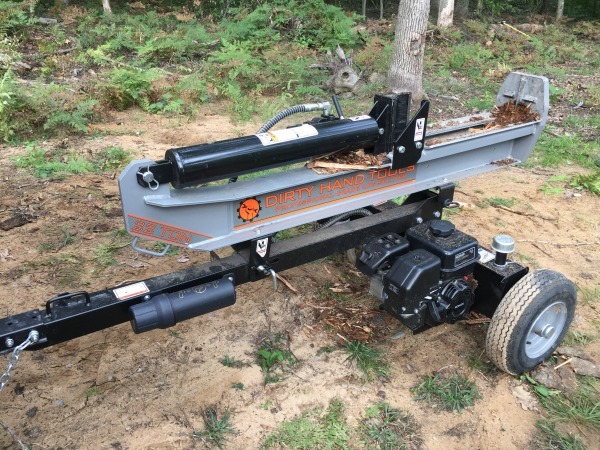 Here's the good news, if you're looking for a heavy duty, affordable, well made log splitter that can split virtually anything you throw at it, consider purchasing the 22 ton professional grade log splitter by Dirty Hand Tools. A friend of mine recently purchased this log splitter and he describes it as "something I should have bought a long time ago." In fact, he absolutely loves it, and for the price it's one of the best splitters available. 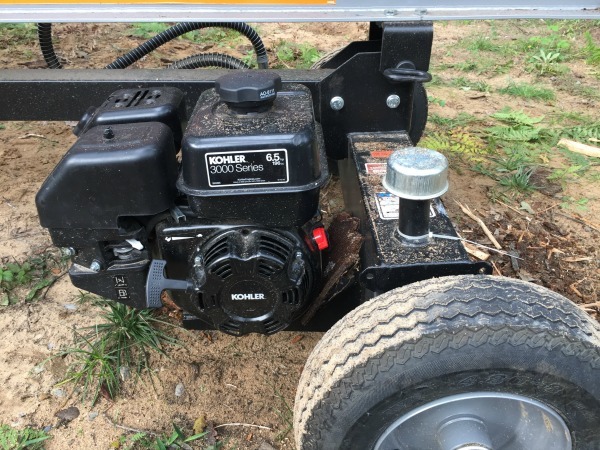 The 22 ton model has a Kohler SH265 gas powered engine that delivers 6.5 horsepower for enough power to split virtually any log you would want to burn. Twisted pieces of oak, knotty wood and even the crotches that would be nearly impossible to split by hand are easily split into manageable and burnable pieces with this splitter. It comes standard with an auto return and adjustable detent making it convenient to just hit the lever and allow the splitting wedge to return while you go grab another piece saving valuable time. Plus it has a 10.9 second cycling time so by the time you get back with another piece of wood to split, the splitters ready to go. 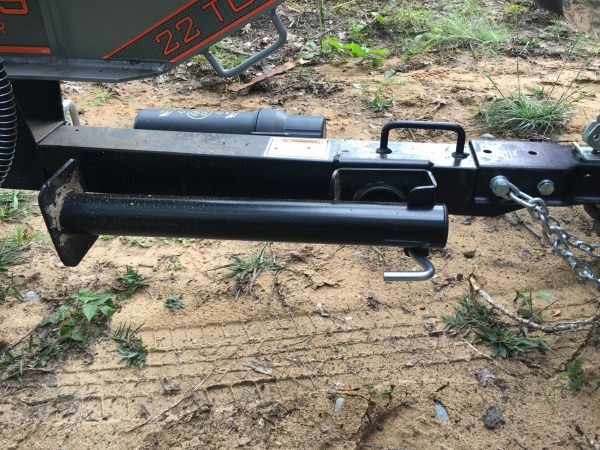 Weighing in at 595 pounds the Dirty Hand Tools log splitter tows really nice and it has a standard 2 inch coupler and safety chains making it easy to attach to most hitch assemblies. Even though it's heavy, you can easily maneuver the splitter by hand, and it has a handle on the top near the receiver making it easy to lift without having to grab it by the frame. The log cradles are also very beefy and wide making it easy to place a log on the unit without it rolling off. Plus, the cradle has a tape measure sticker attached to the side which makes measuring logs nice if your fireplace or wood stove can only accept a certain sized log. If you have a log that's too long you can trim it. This prevents those logs that are too long and won't fit inside your wood stove later on. Since it's just a sticker, it does wear over time so it might be a good idea to make a mark on the cradle so you know what your maximum log length is. The Kohler engine starts very easy. It usually takes about 2-3 pulls when it's cold but after it's warmed up a single pull will start it nearly every time. Plus, the Kohler engine is very quiet compared to other models I've used and it practically sips the gas, making it affordable to run. The hydraulic ram and beam are very strong and heavy duty. Much stronger than other 22 ton log splitters on the market. Plus all the hoses are protected with a wire wrap which prevents falling logs from puncturing the hose....something that I've had a lot of problems with when using the Huskee 22 ton log splitter. 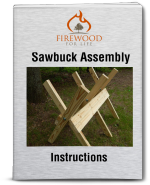 You can also purchase an attachable log cradle that bolts to the side of the beam. This is very handy when you're splitting logs by yourself because it prevents the split pieces from falling to the ground which not only saves time, but saves your back as well! 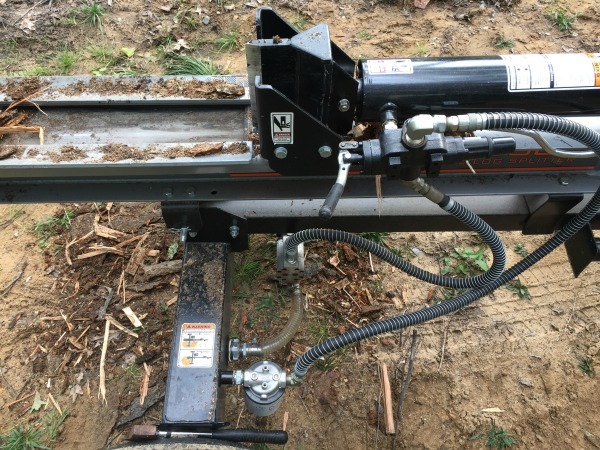 The hydraulic log splitter can split both horizontally and vertically by simply pulling a spring loaded pin and lifting the beam and ram to a vertical position. This works great for oversized logs that are just too heavy or dangerous to lift. Simply roll the log to the splitter when it's in the vertical position and split it while it's still on the ground. Overall, when compared to other 22 ton log splitters, the Dirty Hand Tools log splitter is a great buy. It's extremely heavy duty, has enough power to split virtually any log, and it's affordable. If you're looking for a great log splitter, I highly recommend the 22 ton professional splitter by Dirty Hand Tools....it's a great product!